if you’ve been watching television this week, you might have seen ITV’s news report series on Turkana, Northern Kenya. Called “Fighting Famine”, journalist Marc Mallett has been tracking the impact of what is being described as the “worst humanitarian crisis in decades” on one of the poorest regions in the world. The reports have featured the work of one of Aidlink’s local partners, Caritas Lodwar, as they attempt to respond to the urgent needs of people on the brink of starvation. With almost 3 years of little to no rainfall, Turkana County finds itself in the midst of a severe drought. The goats and camels that people depend on as their source of food and income are dying, people are walking up to 30 kilometres for water with no guarantees that the pump is working when they get there, production of maize is down 50% leading to food shortages, and almost half a million people are in need of humanitarian food assistance. The situation is becoming critical. 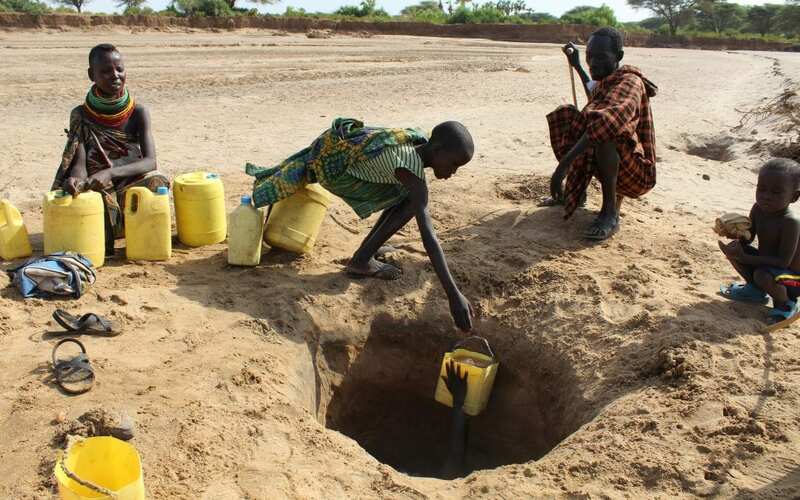 Approximately 25% of people in Turkana are malnourished, with the North of the County worst affected. Here, 75% of households are not getting enough food to meet their needs. 55% of children under 5 in Kibish, near the Ethiopian border, have been assessed by UNICEF as acutely malnourished. Increasingly, families are having to employ coping strategies to ensure their survival. This means skipping meals and reducing portions to the minimum, selling household assets including livestock, and migrating into the urban centres in search of casual labour. More and more children are appearing on the streets of Lodwar, the biggest town, putting them at risk of child trafficking and sexual abuse. Thanks to our donors and the public, Aidlink has been able to provide approximately 4,000 children under 5 with supplementary food, a porridge-like blend of corn and soya fortified with vitamins and minerals, to address the effects of malnutrition and keep them alive. But we need your help to do more during this critical phase. With another partner, the Girl Child Network, Aidlink has identified 15 schools in Turkana with over 3,000 students that require support for a feeding programme. Currently, these schools are reporting that they have lost between 50 and 75% of their registered students as a result of the drought. Most of the boys have migrated with their animals in search of pasture; for the girls, they spend their days searching for water and firewood rather than learning in a classroom. For every day that these children are out of school they are at risk, not just of missing out on an education and the chance of a better life, but of sexual abuse and other forms of violence. Girls as young as 11 will be married off by desperate parents who are looking for a “bride price” to replace the income they have lost because of drought. These girls generally have no choice and accept their fate, seeing themselves as the only hope for helping the rest of the family to survive. Evidence from across the world shows that when there is food available, children stay in school. With every year of education, a person’s average earnings increase by 10%, offering people the chance to lift themselves out of poverty. A child born to an educated mother is 50% more likely to survive past the age of 5. If every child in the world completed primary education, over 7 million cases of HIV could be avoided in the next 10 years. Education is the most vital tool we have in the fight against poverty, but right now, too many children in Turkana are not in school. €600 will enable Aidlink to implement a feeding programme in 1 school for 1 month, benefitting approximately 200 children. Our aim is to feed 15 schools for 3 months, helping to keep 3,000 more children in the classroom, safe and learning, during one of the worst droughts in decades. In the short term, the lives of these children will be saved; in the long-term, their lives will be changed. To donate to Aidlink, click here.